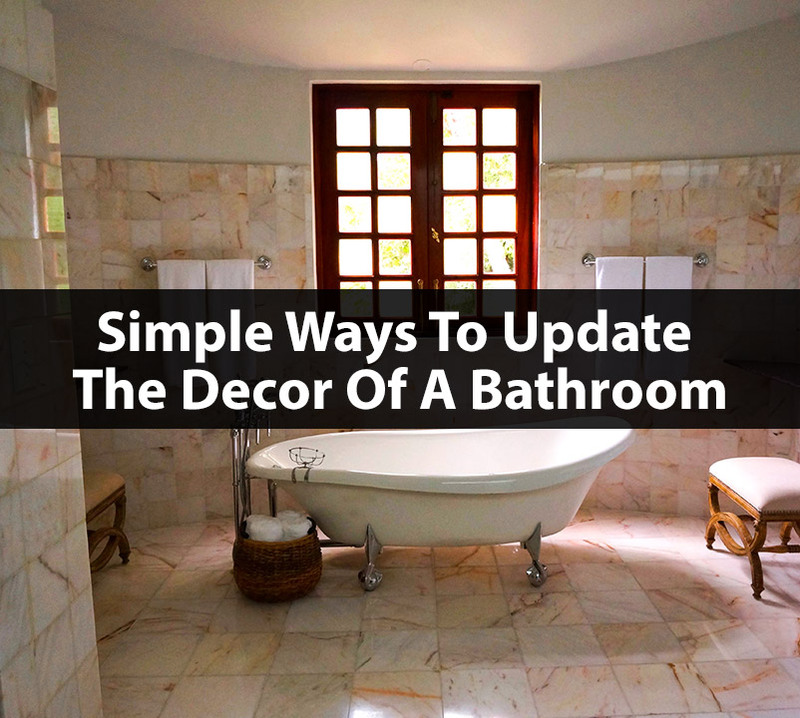 Bathroom decor is a great way to refurbish or upgrade the bathrooms in your house. The bathroom is one of the places we frequent most in the home. When our guests come, they may not venture into the kitchen or bedrooms, but odds are they will require to use a bathroom. 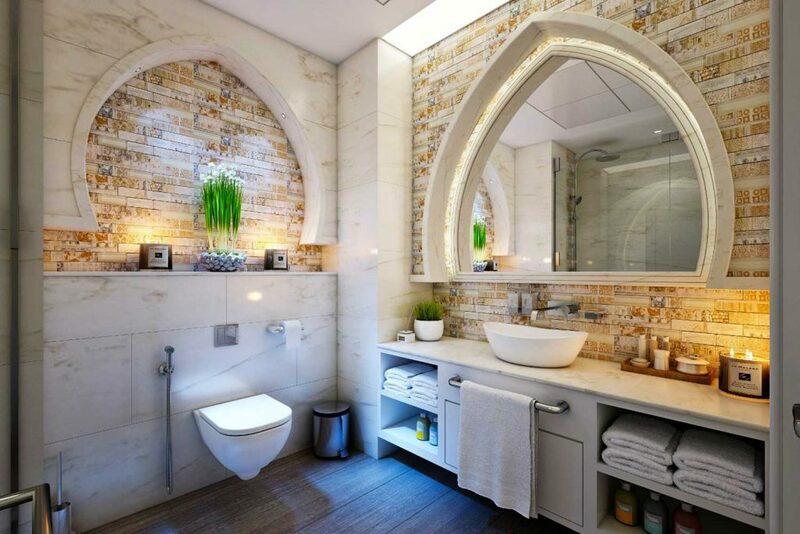 Since bathrooms are open to a lot of exposure, it’s a good idea to make them look nice. It also a pleasant experience to use a beautiful bathroom, so it’s up to us to make ours as beautiful and functional as possible. 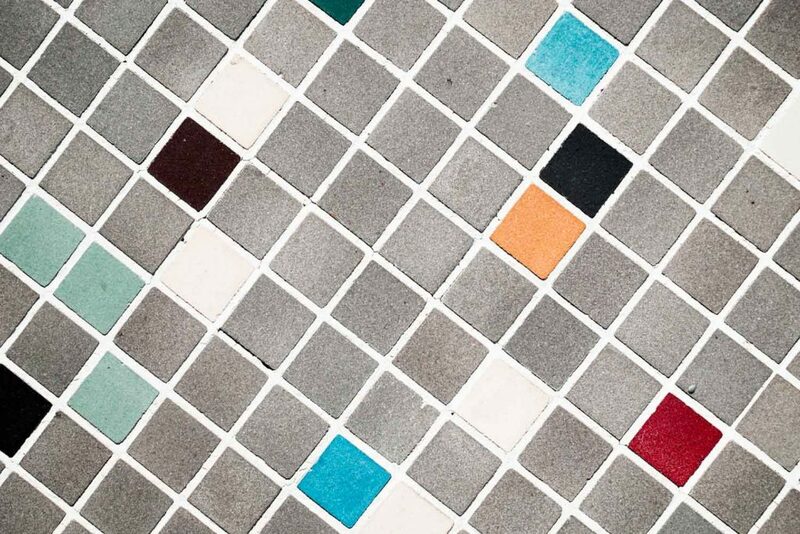 If you live in an old house, chances are your bathroom tiles have seen the best of their days. One way to completely change the look of a bathroom is to replace the tiles and paint the room a different colour. Peeling or faded paint ages a room and old tiles can let water through and even allow mould to grow. There are affordable and durable bathroom tiles you can use for your bathroom decor project. You can also purchase waterproof, mould resistant paint to change the colour of the walls. Choose light, bright colours to bring some cheer into the room. 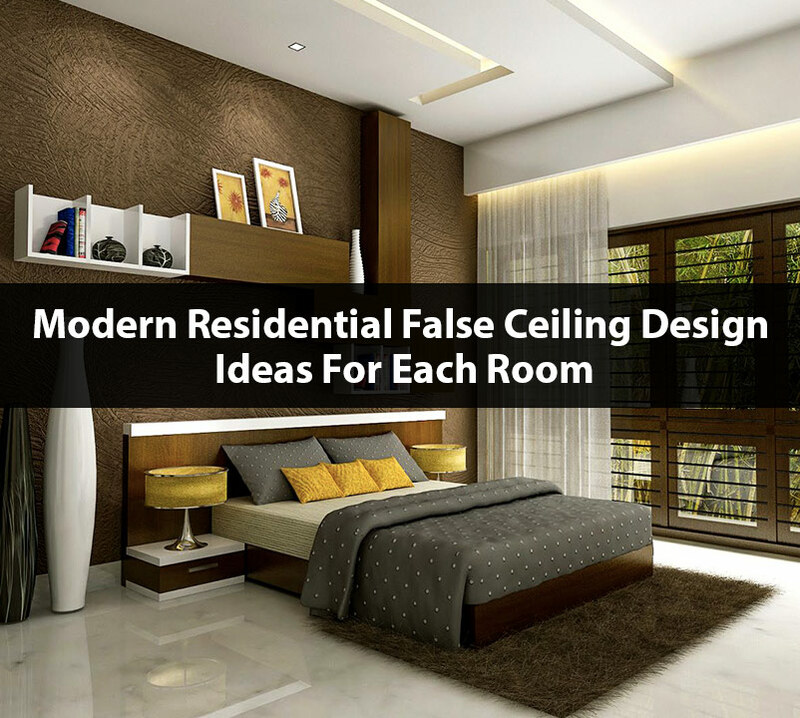 A good thing about these projects is that you can do them without the need of hiring help. You can make it a fun family project and save money in the process. 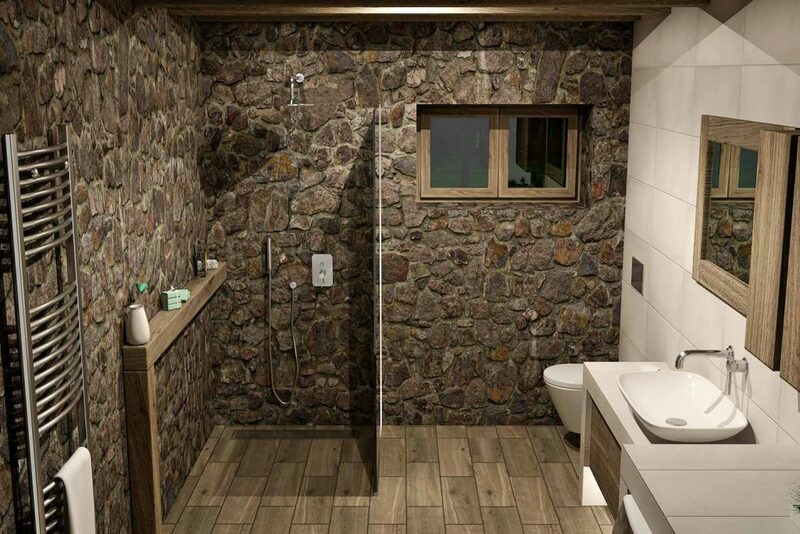 Alternatively, if money is not an object, consider installing waterproof bathroom wall panels instead of tiles. Its a modern option that is functional yet attractive and there are many designs to choose from to suit any colour scheme. Some of our bathrooms have shower curtains and mats we have used for ages. It’s time to let go of your old shower curtains and bring in some new ones to improve the place. Also, consider changing the floor material and mats at the same time too. You will be surprised how different a bathroom looks when you replace the shower curtains and floor mats with new ones. Choose a dominant colour and replicate it in the towels, bath mats and curtains; make it the main decor colour in the bathroom to make everything pop. Make sure you purchase mats that are waterproof preferably with a rubber backing. Plush bathroom rugs that are soft and absorbent feel good underfoot and look amazing. When it comes to the floor, you can put in waterproof vinyl flooring which is warm as compared to porcelain tiles and also brings a look of elegance to the room. You can make room in a bathroom by changing up the storage areas such as cabinets and shelves. Many bathrooms have storage cabinets that open outwards that often make the bathroom feel crowded. Instead, opt for floating bathroom cabinets with sliding doors you can slide open and shut. Also have floating bathroom shelves at eye level over the bathroom mirror where you can place hand towels, toothbrushes, toiletries and more to free up the bathroom counter space. Any storage space or cabinet under the counter should also have sliding doors. Here you can keep cleaning products for your bathroom. Gone are the days when we used to put soap in a simple soap dish at the sink. We now have beautiful soap dispenser sets for the bathroom that look elegant. They are available in a variety of colours and shapes, and you only have to choose what suit your taste. You can have a soap dispenser for your shampoo and body wash as well as you hand wash cream at the sink. It’s a good idea to choose soap dispensers that match the primary colour in your bathroom decor. If you are a minimalist, there are lots of soap dispenser sets that come in neutral colours such as silver, black and white. 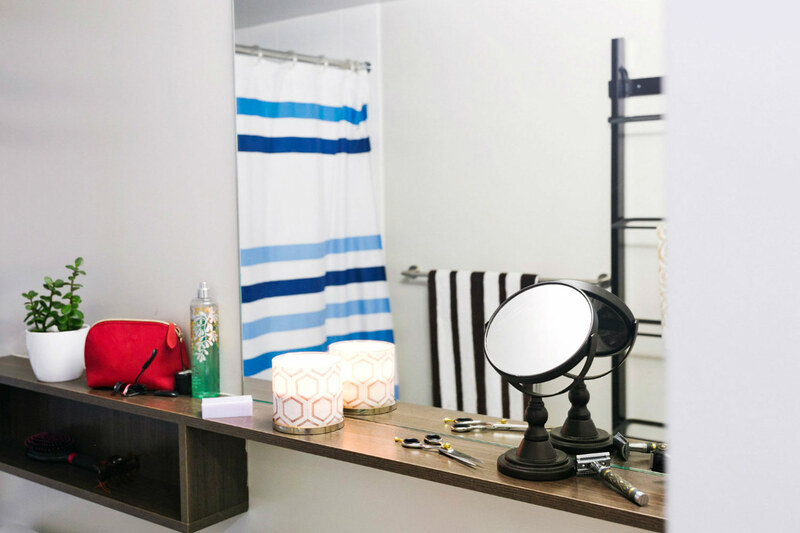 You can get light fixtures that not only light up your bathroom but also set the mood in there. They come in interesting shapes, colours, and finishes to suit any decor. You can have a lamp at the bathroom vanity and some wall scones over the bathroom mirrors. You can also change the boring regular bathroom central light fixture and replace it with a beautiful chandelier. There is also the option of installing mood lighting with changing LED lights on a gypsum ceiling in the bathroom. It will allow you to change your bathroom light colour to anything you want. The options are endless, keep in mind that you can use lighting fixture for more than lighting these days so get creative. There are other small decor items or knick-knacks that you can use to improve your bathroom. These are small functional things you can add to decorate your bathroom. Start by placing elegant bathroom vases on your hanging bathroom shelves or countertop with fresh flowers or artificial ones. Alternatively, you can put a small pot or two of plants in strategic places. Flowers and plants give a room such great ambience, and they will improve your bathroom space significantly. You can also add candlesticks on which you can place fragrant candles. 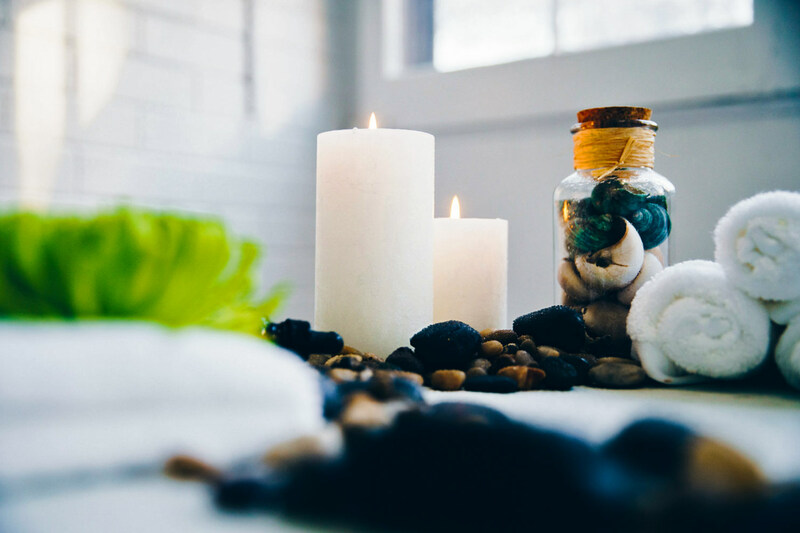 Candles come in handy when you are having a warm bath, and they make a bathroom smell good. Using them during a long relaxing bath calms the senses. Make the candle holders or candlesticks attractive to bring more beauty to your bathroom. You can also put in a room diffuser instead if candles are not your thing. Other things that you can add to your bathroom include decorative soaps, wall pictures, paintings, a woven wastebasket, decorative containers, and sculptures. You can use the decorative containers to hold bathroom items such as cotton buds, earbuds, combs and brushes among other bathroom necessities. Just remember to keep it simple by choosing only a few functional bathrooms knick knacks to include in your bathroom decor. 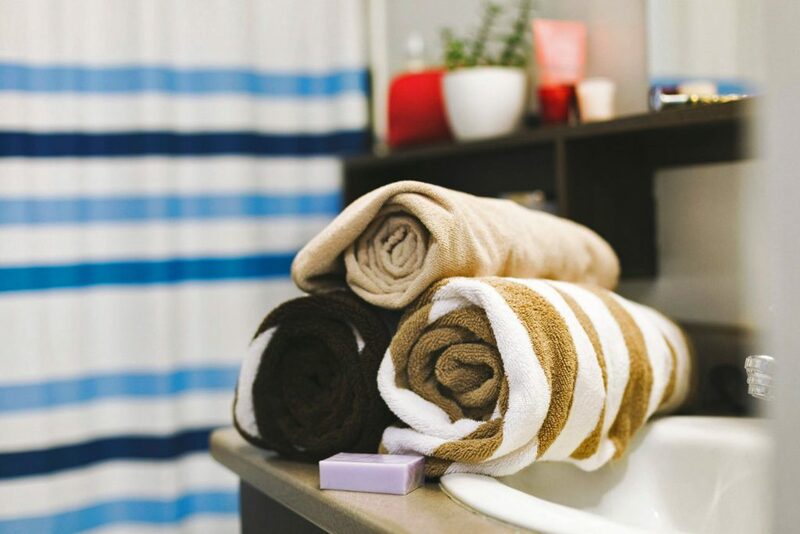 If you are using old towels, you can upgrade your bathroom look by buying new ones. Sometimes this is inevitable when you change your colour scheme. Also the more we use towels, the rougher they get on the skin. These days bathroom towels are getting bigger, softer and more absorbent. 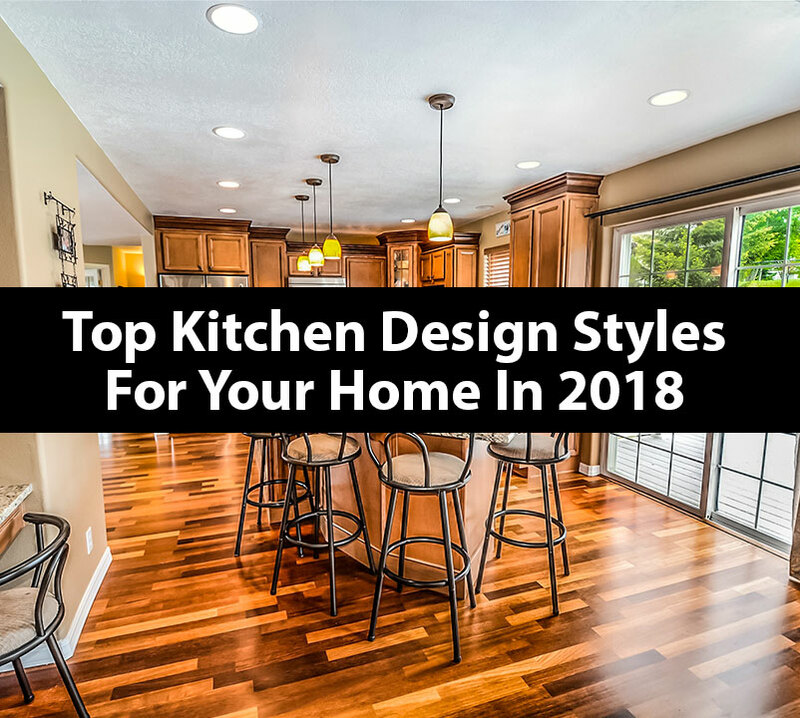 You also have a variety of great colours to choose from so that you can pick the ones that match other things in your bathrooms such as bath mats and shower curtains. You can have small towels for bathing and hand drying, big ones to dry off the body after a shower, and even some decorative towels whose purpose is to look good on your towel rack. If you want to minimize on towel use in your home, you can also get disposable paper towels to use after each hand wash. 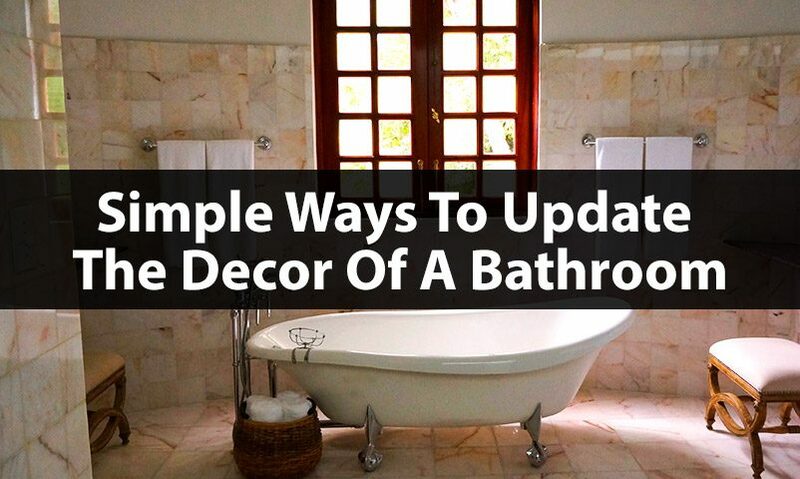 These are a few suggestions on how to update your bathroom decor. You don’t have to do it all at once; you can do it step by step based on the time and money you have at hand. Also, you don’t have to use a lot of money as there are many ways to redecorate your bathroom on a budget. Overall, refurbishing the bathrooms in your home is a worthy project on which to spend your time and energy. So why don’t you start your bathroom remodelling project today! 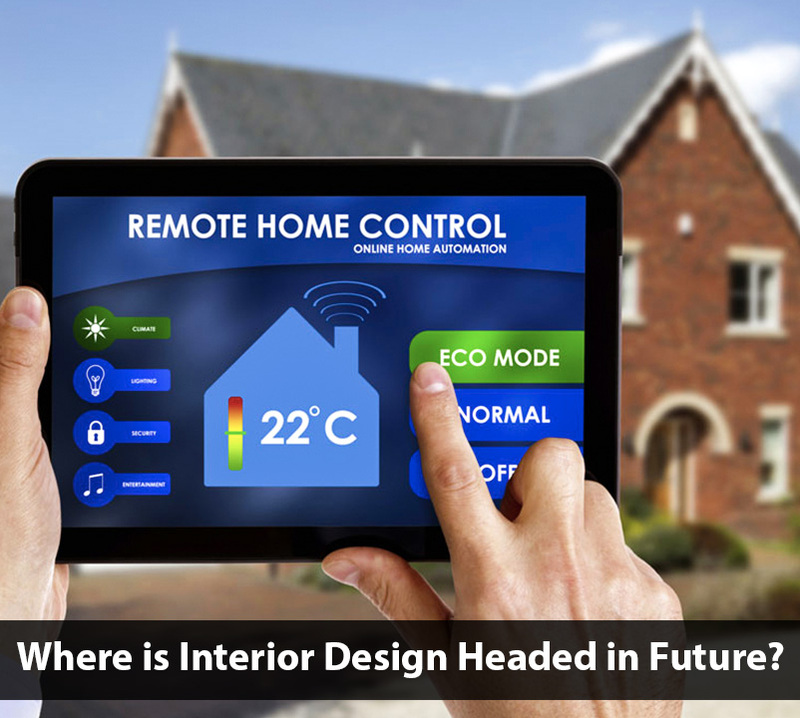 Where Is Interior Design Headed In Future? Interior design is the art and science of enhancing the interiors of a home to achieve a healthier and more aesthetically pleasing environment for the end user. Greetings! I\'m Gayathri from SevenDimensions. How may I help you?